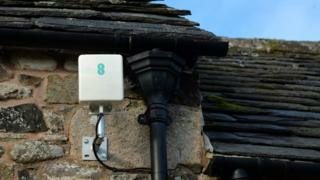 EE's Simon Till said the "shoebox-size" antenna would let more people access the company's 4G broadband service. "We've heard of farmers doing a similar thing, putting up masts on their edge of their property near where the signal is," said Andrew Ferguson of the news site Thinkbroadband.com. "The DIY approach has been bubbling away, but EE offering it as a service makes it a lot more simple." "There may be instances where that's the case, but our network reaches 90% of the UK," said Mr Till, referring to EE's geographic coverage across the UK. "If you overlap our network with the homes that get less than 10Mbps fixed broadband, you get to about 580,000 homes that we could reach." "Stick the antenna outside and you get a much better signal," he told the BBC. "Unfortunately, with it being 4G, that's where the data allowance comes in. If you're bingeing TV box sets you'll get through that pretty quickly." Similarly priced fixed broadband packages are usually advertised as "unlimited". Mr Till defended the data allowance and said EE's home broadband customers typically used about 150GB a month. "If your home has access to fixed broadband, then that would probably be the right choice, but if you can't then this is an option," said Mr Till. "We're in the business of providing connectivity to those that don't have it." Having hit a target of giving 95% of homes access to superfast broadband, the government now has a thornier problem - working out how to connect the remaining 5%. So there will be a welcome for EE's initiative, which appears to be a solution to delivering the Universal Service Obligation - the right to demand a broadband connection of at least 10Mbps. The government had always said that various technologies, including 4G, would need to be deployed if every corner of the UK was to be given an acceptable connection. But rural broadband campaigners will still need convincing that EE's 4G home service can deliver acceptable speeds at a reasonable price.